Zur-Klein is an astrologist. Tal Rinkov is an artist who created 37 cards for the Astrologist in accordance with an agreement between them which, inter alia, related to the copyright ownership. (Ms Rinkov was also the kindergarten teacher of Ms Zur Klein’s daughter, which is how they met (some would say it was fate). The original artwork and the copyright of the artwork was to remain that of the artist. Ms Rinkov was hospitalized in November of that year and only delivered 37 designs, and the last three were completed by another artist. (For reasons not apparent, the medium missed this eventuality). The images were transferred to a graphic artist who made various graphical changes to make the images more suitable for printing. After various commercial entities expressed interest in the images, Ms Zur-Klein contacted Ms Rinkov to try to negotiate a transfer of copyright but due to a difference of opinion, no agreement to transfer the copyright issued. Ms Zur-Klein publicized the images in various internet sites including her own and other people’s, in her blog, Facebook page and elsewhere. In all reproductions of the cards on the Internet, the artist’s signature appeared, but her name and contact details were not given. Indeed, on some websites, Ms Zur-Klein presented herself as the creator of the card (the term יוצרת הקלפים is used, which is both creator and manufacturer so the term is somewhat ambiguous). Furthermore, Ms Zur-Klein allowed other astrologists to use the designs without giving any credit to Ms Rinkov. There was also a newspaper article featuringMs Zur-Klein that was illustrated with one of the card designs that was also not credited. On 6 June 2012, Ms Rinkov sent Ms Zur Klein a Cease & Desist letter. Tal prepares for Carni 39 pictures, which together with the picture already executed, provides a set of 40 pictures for cards and other purposes – payment 5000 Shekels. Apart from the payment for the work, there will be no other royalties for selling packs of cards, books, CDs and other astrological items depicting the images of Tal Rinkov. 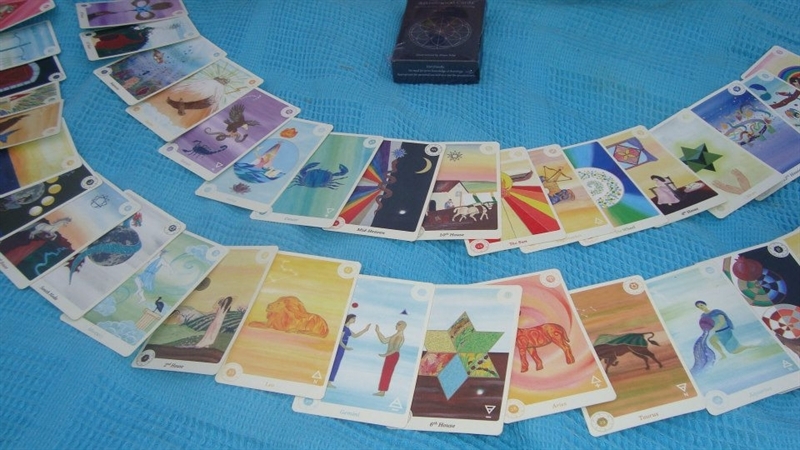 The astrological products that Karni is allowed to use the pictures on are: packs of cards, books, audio CDs, video for watching, a banner for a website, business cards and other articles on authorization from the creator. Karni may not manufacture or distribute artistic works such as pictures, mugs, key-rings and the like. All material displayed on the Internet are at low pixel count. The name, website and contact details of Tal Rinkov will appear on all products, including future products. The pictures on the cards and elsewhere will include the artist’s signature. The original artwork and copyright remains the exclusive property of Tal Rinkov. Pictures and associated artistic products (that are not astrological) will be produced and distributed exclusively by Tal Rinkov. Any deal that Karni creates for Tal will generate a 20% commission for Karni. When Tal sells a product (book, CD, cards and the like) she will profit 20%. Tal will receive a present of a pack of cards. According to the plaintiff, the defendant wrote the contract after the negotiations. The defendant claims, however, that the contract was the plaintiff’s idea, and that the plaintiff had written most of the clauses to the detriment of the defendant, such as her not getting benefit from sale of the cards. However, the defendant agreed that she had printed out the agreement. The defendant claimed that she was entitled to the status of co-creator in the cards as although Ms Rinkov executed the artwork, it was to her, Ms Zur Klein’s specification regarding the symbolism, colors and charms. The plaintiff considered this a change of direction in the defence and objected to it on principle. The judge ruled that the claim that the defendant hand guided the artist appears in clause 31 of the defence, but is more a factual than a legal defence and so she was willing to contemplate it. The plaintiff countered that Carni Zur-Klein had not, in fact, instructed her, but that she herself had researched the elements and colours. Both sides supported their contentions with emails and other evidence. It does seem that the astrologer gave guidelines for the design, but these are by way of astrological knowledge rather than artistic input. In this instance, Judge Lemelstrich did not consider that under section 1 of the Copyright Law 2007, the two parties could be considered co-owners of a joint creation. Section 64 creates a rebuttable assumption that the artist is the creator and each card design was signed by Ms Ronkov as the artist. Section 5 of the Copyright Law notes that the idea, way to implement and facts are not copyright protected, only the artwork itself is. According to Section 35a of the Copyright Law, a work for hire is the property of the artist in the first instance, unless otherwise agreed implicitly or explicitly. In this instance, both the Copyright Law and the contract support the artist as owner of the copyright. In the packs of cards, Ms Rinkov is acknowledged as the artist and Ms Zur-Klein is credited as an astrologer. The parties agree that Ms Zur-Klein conceived the project, but the copyright in the images remain the property of Ms Rinkov. Ms Zur-Klein apparently sold some 80 packs at 190 Shekels a pack. the main issue sees to be the internet reproductions which do not provide the details of Ms Zur-Klein. The ruling now relates to various astrological websites. Since I find this subject matter morally, ethically and religiously abhorrent, I am refraining from reproducing the links. The important thing is that Judge Lemelstrich considers that the artist’s moral and financial rights were compromised in numerous infringements in various websites and internet campaigns. That said, the pictures on the Internet were not reproduced at a quality to enable them to be printed and used as playing quality cards. The changes to the designs for subsequent printing by a graphic artist under the direction of Ms Zur-Klein were minor. These were considered insufficient to create a change to the copyright, in that the original work could not be considered defaced or the artist’s moral rights compromised. Nor did the amendments constitute a copyright protectable creation. Ms Rinkov claimed 100,000 Shekels in statutory damages for copyright infringement and a further 100,000 Shekels for moral rights infringement, particularly noting the long and arduous legal proceedings and the multiple infringements. Judge Lemelstrich noted that despite entering a clear contractual relationship to the contrary, Ms Zur-Klein acted as if the creations were hers to do what she liked with. She ruled 35,000 Shekels damages for infringing the moral rights, 15000 Shekels for infringing the material rights and a further 5000 Shekels for an article published after the Cease and Desist letter. Judge Lemelstrich of the Haifa District Court ruled a permanent injunction against Ms Zur-Klein, her delegates, substitutes and others from performing any action that violates the September 2011 agreement or other rights as per the statement of case. Ms Zur Klein will compensate Ms Rinkov 55,000 Shekels for copyright infringement, an also will pay 15000 Shekels legal fees. The money will be paid within 30 days.